Giant Rock & Integetron, Landers, Ca. 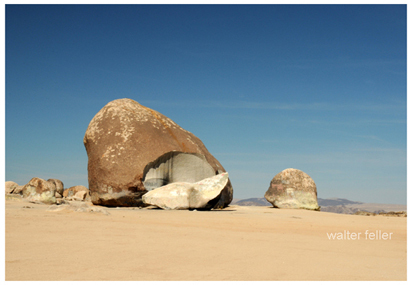 a strange rock in the California desert about 16 miles north of Highway 62, between Yucca Valley and Joshua Tree on a wellgraded dirt road. 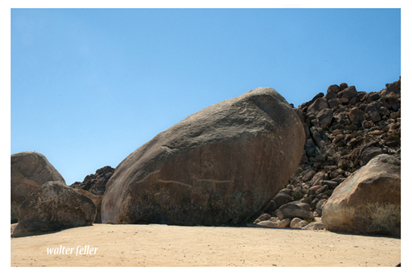 It is estimated to weigh more than the'Los Angeles City Hall; in fact, some authorities claim it is the largest "boulder" anywhere in the world. And, like a glacier, more of it lies under the ground than above. Even stranger is its history; specifically, the years between 1929 and 1942 when an eccentric German immigrant named Frank Critzer called it home. Critzer had carved with chisel and dynamite a threeroom cave in the giant rock, all of it below ground level, and lived there alone, snug beneath tons of granite towering seven stories above the sunken entrance. Though he fled to the desert by choice from his job as a commercial fisherman and, briefly, worked in a Los Angeles area aircraft plant, Critzer was not really a recluse. After he had fashioned his living quarters and furnished them with a degree of luxury, he carefully graded the road to his rock, towing a scraper behind his old Essex. He then created an airstrip on a nearby dry lake bed and pilots, seeing his windsock flying, dropped down and landed, first from curiosity and later because they found Critzer to be an excellent mechanic. He and his strange home in the giant rock also were popular with land-bound neighbors, who packed picnic lunches and drove out to marvel at his ideas and accomplishments. Actually, however, Critzer was as uncommunicative as his rock, offering nothing, asking nothing and telling nothing, except to his friend George W. Van Tassel. Van Tassel had gotten Critzer his job at the aircraft plant in El Segundo and when the latter quit, they visited together frequently at the rock in the desert. Not much is known about Van Tassel's early career, except that he too was considered somewhat eccentric by his associates at Douglas, Hughes Aircraft and Lockheed. He was employed as a largely self-taught flight engineer, but spent every spare moment probing the mysteries of what, prior to World War II, was considered the remote, at best, possibility of manned space flight. And if round-trips by humans from earth were "remote," the idea of visitations from elsewhere in space drew little if any serious thought from scientists and engineers of the time, except from Van Tassel. The friendship between the two men was deep, and Van Tassel was shocked when it ended abruptly and tragically on July 25, 1942. It seemed that the general war hysteria and fear of all things German had caused Critzer's neighbors to suspect he was a spy, communicating by radio directly from his rock to Adolf Hitler. The FBI did investigate, but found nothing more suspicious than a harmless old man with a German accent and an old, battery- powered Kent radio which could barely receive Jack Benny from Los Angeles, much less transmit coded messages to the Fatherland. Nevertheless, rumors started by neighbors who forgot that Critzer had built their roads and helped pipe water to their homes persisted, and so three sheriff's deputies from Banning showed up on that fateful July day to investigate once again. This time it was the allegation that Critzer had stolen gasoline, tools and dynamite. Stories differ as to what actually happened when the deputies arrived at the rock. Some say Critzer panicked when he saw them and locked himself inside his rock. Tear gas fired by the deputies was said to have triggered the explosion of 200 pounds of dynamite that Critzer kept on hand for use in his mining operations. Another version has it that the deputies actually got inside the rock and questioned Critzer. When they announced they were taking him into Banning, it was alleged that he purposely touched off the dynamite after barely allowing the deputies time to escape. In any case, Critzer was blown to bits, but not his rock or the hand-hewn home within it. This was tragic, for there was no evidence at any time that Critzer was anything but innocent of all charges. Van Tassel mourned his friend while the rock stood empty throughout the war years. In 1947, he leased 2,600 acres of government land, including that part upon which the rock rested, and moved in with his wife and three young daughters. The rooms where he once had secretly helped Critzer develop a glass aircraft-engine crankshaft "stronger than steel" and formulae for Teflon-like plastics years ahead of Du- Pont now rang with children's laughter. Van Tassel installed a light plant and the girls traveled all the way to Twentynine Palms to attend school. 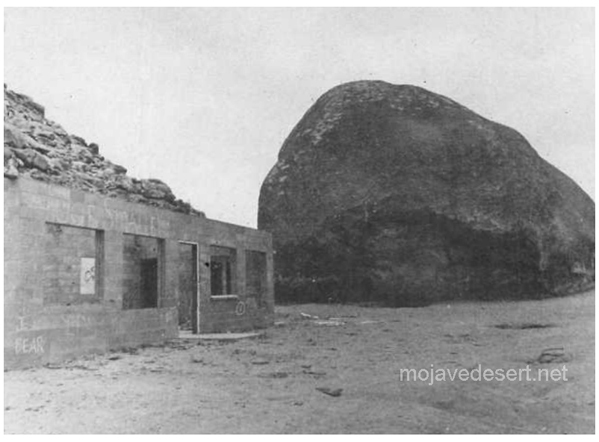 It was a normal desert family by any standard, except that they lived in a rock. The Van Tassels could even be considered gregarious. They built and operated a cafe to feed the campers who parked on their land. The airstrip was still in use, and rock hunters had permission to take home the semi-precious garnets, agate and jasper they found scattered about. The more serious hobbyists could dig and maybe uncover ruby, amethyst and striated quartz specimens. It was an "in" place for desert buffs to spend weekends, but one morning in 1951 an event occurred which led to much larger gatherings of another kind of buff. It changed Van Tassel's life. According to his story, a great airship passed over the mountains on the far side of the air strip. It seemed faster and larger, maybe 400 feet in diameter, than any aircraft known at that time to man. At First, he kept his story to himself. Who would believe him? A prospector who saw the same craft from eight miles away would, and then the sighting was confirmed by another man just two miles away. George Van Tassel had seen an Unidentified Flying Object; unlike the many others who claim to have shared a similar experience, he did something about it. At Giant Rock, as it now was named, Van Tassel hosted the first of a series of annual Flying Saucer Conventions which, at their peak, drew 15,000 people from all over the world. He founded the "Ministry of Universal Wisdom, Religion and Science Merged," G.W. Van Tassel, Presiding Minister. By 1-967 he had appeared on more than 300 radio and TV shows. Among believers, he was the acknowledged leader. No one doubted his claim to have hosted visitors from outer space on several occasions at his home inside Giant Rock. Details of its construction and purpose are obscured by jargon passed on, perhaps deliberately, by Van Tassel. It is said to contain an "electrostatic, magnetic generator with armatures more than four times larger in diameter than any others in existence." On the outside, there is "a rotating ring of silver spikes, designed to swirl around the dome at great speed." None of this makes much sense to engineers trained in conventional sciences. But, nevertheless, it and an adjacent, smaller dome are expensive structures, paid for by Van Tassel's Ministry of Universal Wisdom, whose members believe the "Generator" will work. Unfortunately, George Van Tassel died in February, 1978, without completing work on his machine. Unlike his friend Critzer, however, his work did not die with him. His associates, led by his widow, Andrea, say they are carrying on where Van Tassel left off and claim the machine will soon be operational. To what purpose? No one who will talk seems to have that answer, unless they are those "visitors from outer space" whom Van Tassel claimed he hosted many years ago. The cafe is now abandoned. Mrs. Van Tassel is reluctant to greet strangers. Not many pilots use the airstrip today. But where else within a few hours' drive of Los Angeles would one be more sure, some bright, moonlit night, of spotting a UFO? Giant Rock is about seven stories high and covers nearly 6,000 square feet.